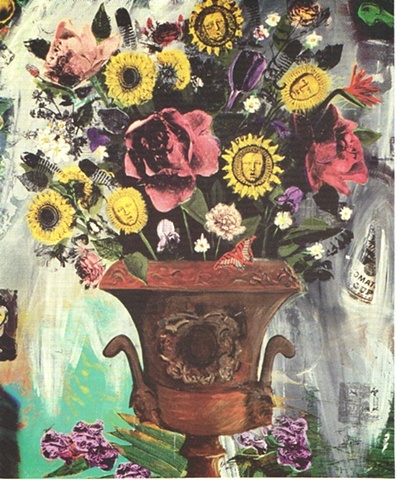 "Flowers at Castle Shannon, " St.Lewis' tribute to Warhol ( who is buried at Castle Shannon cemetery), is strangely lush, somber and wistful at the same time. Courageous and creative sun symbols and sunflowers punctuate a bouquet of full blown ( and a few fallen) flower, each ripe with its own symbolism. Hidden among the welter of paint, collage and imagery, and emerging from below the expressive surface are Warholian icons appropriated from his paintings: Marilyn Monroe, a can of Tomato soup, a dollar bill".